We had evidence that our maintenance product was not strong enough to protect many equine athletes during periods of increased stress. Therefore, we formulated a stronger Gut Protector that contains an additional 11 herbs and 8 essential oils that specifically target ulcerated tissue. Stress exacerbates ulcer conditions. 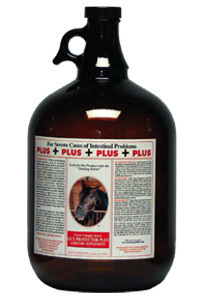 Gut Protector Plus is formulated to treat ulcers and establish balance in the gastrointestinal tract. When stress is high, ulcers often become more severe. As we push for better competitive performance, pre-existing ulcers worsen, presenting a serious problem. Gut Protector Plus is easy to administer and it tastes good. It contains 11 herbs and eight essential oils that specifically target ulcerated tissue, plus 2 added herbal ingredients that stimulate appetite. It is all natural and will not test positive. Best of all, it works! Just ask the people who use it. Ingredients: Water, aloe vera liquid, licorice extract, rhubarb extract, fructose, apple butter, apple juice, apple cider vinegar, astragulus extract, passion flower extract, cinnamon extract, bromelain powder, maltodextrin, xanthum gum, myrrh, cherry concentrate, honey, highly purified solution of metallic silver colloids, with potassium sorbate and potassium benzoate (preservatives). Also contains an additional eleven herbs and essential oils that specifically target ulcerated tissue.